What if you could make hamburgers for your whole family in a matter of minutes, without dirtying your stove or having to light a grill? That’s the beauty of this game-changing recipe from Molly Stevens and her latest book, “All About Roasting.” I’ve been a huge fan of Molly Stevens ever since I bought her braising book (“All About Braising”) and, I’ll confess, that when the roasting book arrived (I was lucky enough to get a press copy) I dropped whatever it was I was doing and immediately tore into the pages. The recipes and pictures of glorious roasted meats all screamed out to me (I’ve got like 20 recipes bookmarked already) but the one that intrigued me the most was the one for roasted hamburgers. The very concept of a roasted hamburger probably offends the traditionalists among you who think of a hamburger as that sizzled and seared flat patty of meat that sits, crisp and golden, on a bun. That’s certainly the way it’s done at most places famous for their burgers–from Shake Shack on the east coast to In-N-Out on the west coast. But at home, cooking burgers indoors is a hassle. 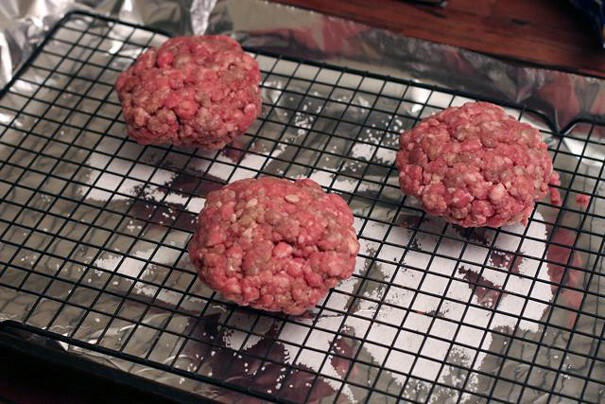 You don’t have a flattop where you can plop the patties neatly in a row; most likely, you have a skillet or two and when you fry up your burgers, you’ve got grease stains all over the stove and a big pile of goo in your pan to clean later. Yuck. The wire rack allows heat to go all around the burger so, in its time in the oven, the outside can still turn golden while the inside stays moist (as Molly points out in her recipe, these burgers shrink less than stovetop burgers do, and are therefore more juicy). 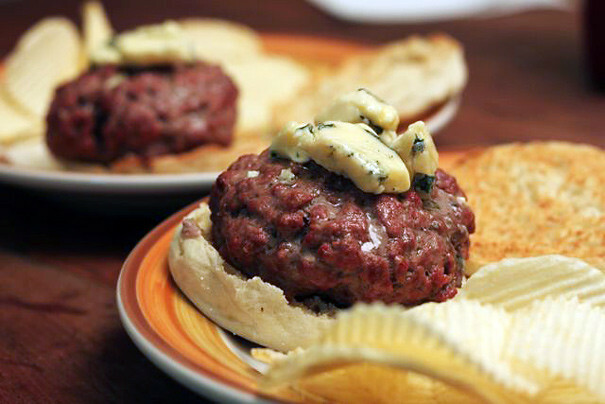 Your favorite hamburger toppings: sliced Swiss or cheddar cheese (I like blue cheese! ), sliced tomato, lettuce, sliced onion, pickles, ketchup, mustard, etc. Position a rack in the center of the oven and heat to 475 degrees (450 degrees in a convection oven). Line a heavy-duty rimmed baking sheet with aluminum foil, and spread a thin layer of salt over the surface of the foil to absorb any drippings and prevent the oven from smoking. 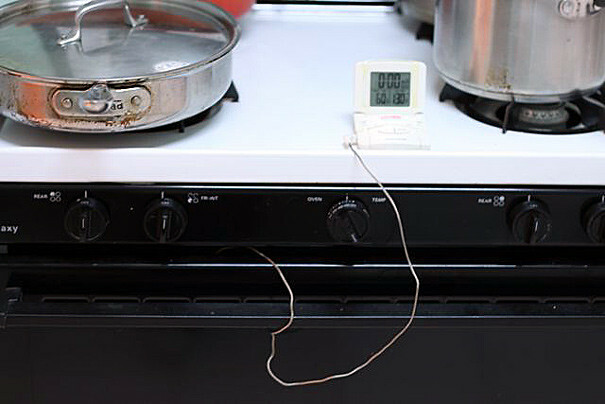 Arrange a wire rack so that it sits at least 3/4 inch above the surface of the pan. 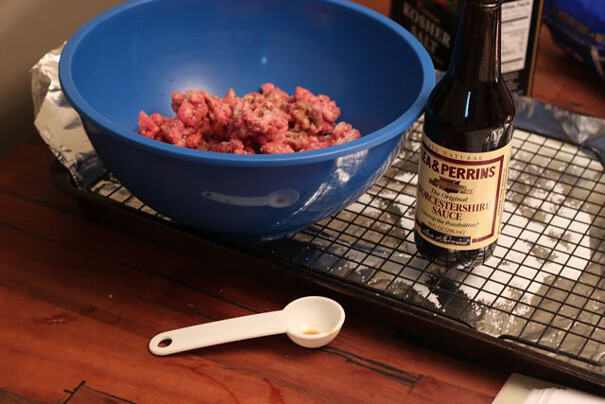 Break the beef into 1- to 2-inch lumps with your hands and drop into a mixing bowl. Season with salt, Worcestershire, and a generous amount of black pepper. Mix gently, using your fingertips to break up the meat and incorporate the seasonings. Over-handling the beef will make for tough, dry burgers. Divide the meat into 6 portions. Molly Stevens likes to eyeball even portions and arrange them, before shaping, on a large plate. “This way I can add a little here and remove a little there until I have 6 equal-size lumps to start with.” If you have a kitchen scale, you can use that too: have it so each burger weighs 5.3 ounces. [My method was just to grab a hunk of meat and shape it willy-nilly.] Lightly shape the beef into disks about 3 1/4 inches across and about 1 inch thick. Set the burgers at least 1 inch apart on the wire rack. 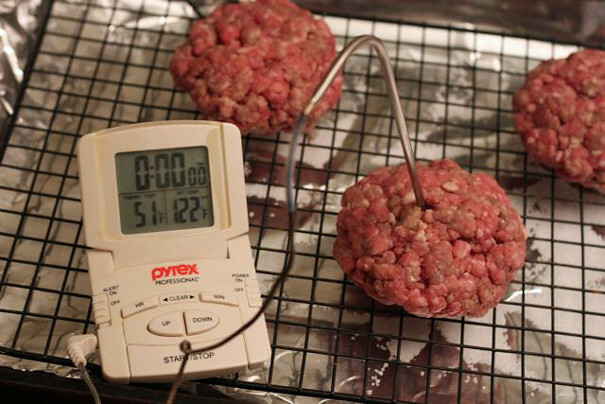 Roast the burgers for 10 to 16 minutes, checking on them either with an instant-read thermometer (the quickest way) or by cutting into one to peek. For medium-rare, look for 130 to 135 degrees; for medium, 140 degrees. (If you’re mad enough to like your burgers medium-well, take it to 160 degrees; but WHY WHY WHY?!). 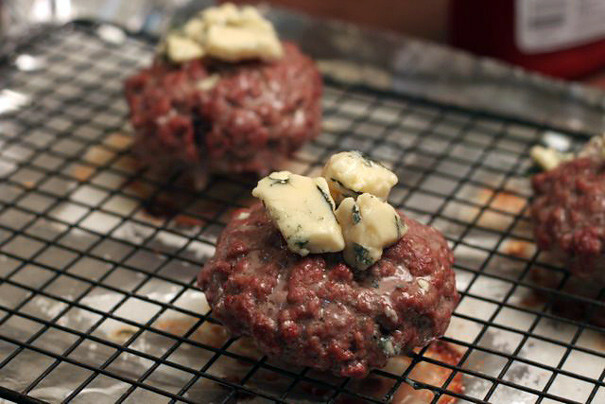 If adding cheese, top the burgers with cheese when they are about 2 degrees away from being done to your liking and return them to the oven for 1 minute to melt the cheese. 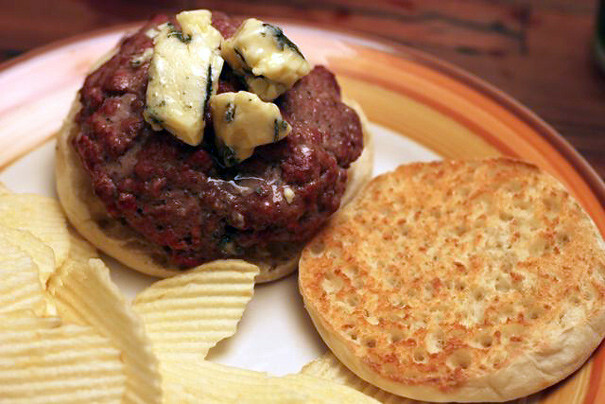 Transfer the burgers to buns, English muffins, split focaccia, or favorite bread and garnish as you like. Make sure your oven’s clean before roasting anything at such a high temperature, otherwise it’ll smoke.